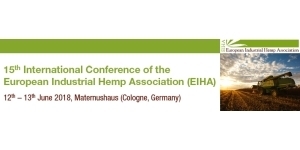 Specialists from all over the world will meet in order to exchange information regarding the latest developments in Hemp applications for fibres, shivs, seeds and oil as well as cannabinoids. Applications are biocomposites in automotive and construction, textiles, food, food supplements and pharmaceuticals. We are expecting 350 international participants from more than 40 countries. For the first time, the Innovation Award “Hemp Product of the Year 2018” will be granted to the young, innovative industrial hemp industry for finding suitable applications and markets for industrial hemp based products. The focus of the award is on new developments within these business areas. Producers and inventors of innovative industrial hemp products are invited to hand in their application by end of March 2018.